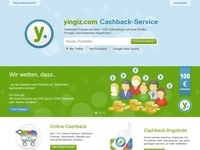 Yingiz is a shopping community where users can earn for your purchases with reputable partners percentages and commissions. Will be paid for each new member. Verification of declarations on incorrect or incomplete data as well as duplicate matching.